With help from the Dallas Lighthouse for the Blind, the designer's work has found a different, more intricate direction. For the few who haven’t already heard Tish Cox’s oft-told Highland Park Cinderella story, here it is: once upon a time, a stay-at-home mom with no formal design experience made a dress for a friend from her kitchen island. Donning the dress at fancy events, the friend earned enthusiastic compliments from none other than Vogue’s André Leon Talley and designer Zac Posen—a couple of magical moments that sparked an eponymous clothing line. Cox’s brand now produces 4,000 pieces each year, many of which are sold from a cozy atelier in the Lovers Lane shop Cabana. It’s a great story, no doubt. 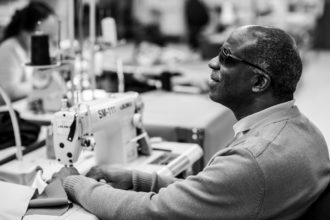 But as of last summer, Cox has an even more inspiring chapter in the works: her luxury clothes are now made by blind and visually impaired sewers at the Dallas Lighthouse for the Blind. Finger guards surround the needles, and strips of packing tape on the sewing bed are used as a guide to make straight lines. Cox made a five-year agreement with the Lighthouse’s newly appointed CEO Hugh McElroy, and they swiftly assembled a team including Forest Bell, the design division director at Wade College, who created a 10-week training course and figured out how to translate Cox’s garment construction into a process that worked for blind and visually impaired employees. Sewers at Cox’s former facility would make a single garment from start to finish. At the Lighthouse, employees usually work on the same section of multiple garments, assembly-line style. Pegs are put on the fabric so that sewers can feel for their place. Once completed, every item is measured and inspected for quality. Bell also figured out how to customize each sewing machine to the individual. Some low-vision people see better with an LED light, others with fluorescent. Machines are outfitted accordingly with an adjustable lamp. Those who don’t wear glasses or sunglasses must use a face guard, a clear plastic shield that swings down to protect the eyes in case a needle breaks. Finger guards surround the needles, and strips of packing tape on the sewing bed are used as a guide to make straight lines. 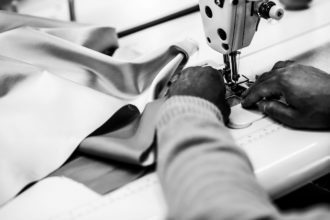 Let it Shine: Thanks to increased production capacity from teaming with the blind and visually impaired sewers at the Lighthouse, Cox plans to show her line at New York Fashion Week for the first time this spring. This new manufacturing setup has had an interesting effect on Cox’s designs. 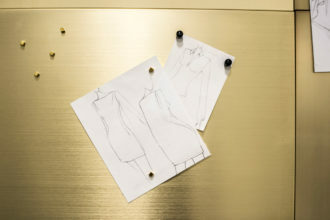 Because it’s easier for low-vision workers to sew French seams—a finer detail involving an additional step—rather than an ordinary open seam, Cox now liberally uses French seams in her designs. She has also experimented with some of the “ancient” machines found in the Lighthouse facility, such as one that sews five perfect seams in a row. Even more significant, the arrangement at the Lighthouse allows for exponential growth. Her previous Dallas facility was small and limited. 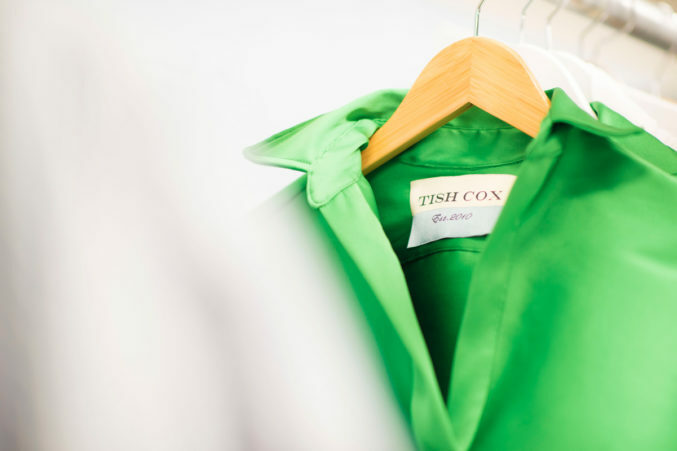 This spring, Cox plans to show her line at New York FashionWeek for the first time. “I have this amazing product, but I was always concerned that if I went to New York and got orders, I wouldn’t be able to fulfill them,” she says. If, say, Barneys makes an order for 50,000 garments, the Lighthouse’s flexible factory system would be able to accommodate it. Cox and her team are already gearing up for expansion by training more sewers. The first class of eight graduated last October, with another class completing their coursework in March. She recalls a moment during the inaugural graduation ceremony in which one young man, born with complete blindness, yelled, “This is the best day of my life!” as he walked the stage to get his certificate. Before taking the training course, he had been packing cans of tuna and mackerel. Now he sews luxurious structured garments that, on average, sell for $500. Everyone also wants to grow and succeed. The Dallas Lighthouse for the Blind is helping Cox do just that.